Wall Street slumps Friday at the end of a brutal month. How will the economic stimulus package help your job situation? 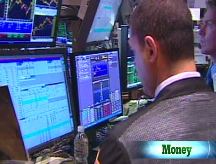 Ali Velshi is at the Chicago Mercantile Exchange for a Special Edition of Your $$$$$. Job creation: Will stimulus work? Tune in Saturday at 1 p.m. ET and Sunday at 3 p.m. ET. Associates at Bingham McCutchen take home an average $256,312 total compensation annually. See which other Best Companies to Work For offer big paychecks. NEW YORK (CNNMoney.com) -- The Dow Jones industrial average and Standard & Poor's 500 finished their worst January ever Friday as investors eyed abysmal reports on economic growth and quarterly earnings. The Dow Jones industrial average (INDU) ended the day down 148 points, or 1.8%. The Standard & Poor's 500 (SPX) index lost 19 points, or 2.3%. The Nasdaq composite (COMP) lost 31 points, or 2%. Stocks gained in the morning as investors breathed a sigh of relief that the abysmal fourth-quarter GDP report was not as bad as economists had expected. Upbeat earnings from Amazon.com and a few other companies also helped Wall Street in the early going. But any early goodwill soon petered out and stocks turned lower. Weak readings on manufacturing and consumer sentiment added to the day's declines, as did more layoff news. Talk that Senate Republicans could shoot down the proposed $819 billion economic stimulus plan also weighed on the market, said Tom Schrader, managing director at Stifel Nicolaus. "There's just nothing good out there," Schrader said. Companies have announced more than 100,000 job cuts this week alone. "What's especially concerning is that we are seeing companies start to lay people off in anticipation of the slowness rather than in response to it," he said. Stocks tumbled Thursday following bleak reports on earnings, housing and employment. That caused the Nasdaq and S&P 500 to break a four-session winning streak and the Dow to break a three-session advance. Investors put money back into stock mutual funds over the past week, after withdrawing money in the previous week. For the week ended Jan. 28, investors poured $6.5 billion into stock funds, according to investment-research firm Trim Tabs. In the previous week, investors pulled $138 million out of funds. Wretched month: It was the worst January ever for the Dow industrials and S&P 500, according to Stock Trader's Almanac data. The Dow lost 8.8% and the S&P 500 lost 8.6% in the month. The Nasdaq's loss of 6.4% was eclipsed by last January's loss of 9.9%. That 2008 loss was the worst in the tech average's history, going back to its inception in 1971. Among the sector decliners during January, it was a particularly ugly month for bank stocks. Fans of the S&P's January barometer know that a weak January can spell doom for the rest of the year, as per the saying "As goes January, so goes the year." Standard & Poor's market historian Sam Stovall has looked at the correlation going back to 1945. Since then, whenever the S&P 500 gained in January, the market continued to rise during the rest of the year 85% of the time, posting an average gain of 11.6% during those 11 months. But the stats are less consistent when the market fell in January. Since 1945, a decline in that month yielded a decline in the next 11 months only 48% of the time, for an average loss in that period of 2.2%. GDP: Gross domestic product growth, the broadest measure of the nation's economy, plunged at a 3.8% annual rate in the fourth quarter of last year. It was the biggest drop in GDP since the first quarter of 1982, when it declined 6.4%. In other economic news, the Chicago PMI, a regional reading on manufacturing, declined to 33.3 from a revised 35.1 in the prior month. Economists expected the reading to come in at 34.9. The revised reading on January consumer sentiment fell to 61.2 from an initial reading of 61.9, according to a University of Michigan report released Friday morning. Economists thought sentiment would hold steady. Confidence stood at 60.1 in December. Earnings: Online retailer Amazon.com (AMZN, Fortune 500) reported quarterly sales and earnings that topped analysts' forecasts after the market close Thursday. Shares rallied 17% Friday afternoon, but failed to help the broader market. Dow component Exxon Mobil (XOM, Fortune 500) reported the largest yearly profit in U.S. history, earning $45.22 billion amid high oil prices. Its fourth-quarter profit fell 33% from a year ago. Nonetheless, results still topped analysts' forecasts. Fellow oil company and Dow component Chevron (CVX, Fortune 500) reported higher quarterly earnings that topped estimates. Shares of both Exxon and Chevron ended lower. Dow component Procter & Gamble (PG, Fortune 500) reported a higher quarterly profit that was nonetheless short of forecasts. The company also warned that full-year earnings would not meet its earlier forecast due to weakening demand. Shares fell 6.4%. Layoffs: Caterpillar (CAT, Fortune 500) announced it is cutting another 2,110 jobs at three Illinois production plant on top of the 20,000 job cuts announced earlier this week. Shares of the Dow component fell almost 3%. Also on Friday, Japanese electronics firm NEC Corp said it was cutting 20,000 jobs. The company is also reportedly in talks to merge its chipmaker unit with Toshiba. Corporations have announced over 100,000 layoffs this week alone, including Starbucks (SBUX, Fortune 500), Boeing (BA, Fortune 500), Eastman Kodak (EK, Fortune 500) and Target (TGT, Fortune 500). Bonds: Treasury prices rose, lowering the yield on the benchmark 10-year note to 2.83% from 2.86% Thursday. Treasury prices and yields move in opposite directions. Yields on the 2-year, 10-year and 30-year Treasurys all hit record lows last month. Lending rates worsened. The 3-month Libor rate rose to 1.18% from 1.17%, according to Bloomberg.com. Overnight Libor rose to 0.30% from 0.22%. Other markets: In global trading, Asian markets mostly ended higher, with the exception of the Japanese Nikkei, which closed lower. European markets ended lower. The dollar gained versus the euro and fell against the yen. U.S. light crude oil for March delivery rose 42 cents to settle at $41.86 a barrel on the New York Mercantile Exchange. COMEX gold for April delivery rose $21.90 to settle at $928.40 an ounce. Gasoline prices rose three-tenths of a cent to a national average of $1.846 a gallon, according to a survey of credit-card swipes released Friday by motorist group AAA.